Image L-R: Mr Gareth Evans, CEO Qantas International and Freight and Mr Cai Jianbo, CEO UnionPay International. Sydney, Australia, 2017-May-01 — /Travel PR News/ — Qantas Airways became the first Australian airline to sign a Memorandum of Understanding (MOU) with UnionPay International, China’s largest payment network provider, to expand the acceptance of UnionPay cards for payment across all Qantas customer touchpoints. 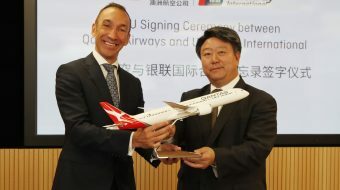 The signing of the MOU took place yesterday at Qantas Mascot campus, witnessed by Gareth Evans, Chief Executive Officer Qantas International and Freight, and Cai Jianbo, CEO, UnionPay International. Under the agreement, Qantas and UnionPay will explore the potential for UnionPay card payments for a wider range of flight reservations and other flight-related purchases such as seat selection and excess baggage. In addition, Qantas and UnionPay will also identify relevant marketing and promotional opportunities beneficial for both brands, including exclusive deals. At present, UnionPay cardholders can only use their cards for flight bookings made on Qantas’ website for flights originating in China. Qantas International and Freight CEO Gareth Evans said that the wider acceptance of UnionPay cards will improve the customer payment experience globally. “With over 5 billion UnionPay cards in circulation around the world, the increased acceptance of UnionPay cards across all of Qantas’ touchpoints gives customers convenient access to one of the most popular payment methods in the world, especially in Asia. “China is critical to our strategy in Asia. Together with our new direct Sydney – Beijing service, the deepening of this partnership reflects our commitment to the region, enabling our Asian customers to travel to and within Australia seamlessly,” said Mr Evans. UnionPay International CEO Cai Jianbo said that the partnership is a significant step forward for greater acceptance of its cards in Australia. “As the China-Australia Year of Tourism, 2017 is an important year for UnionPay to accelerate acceptance and usage of UnionPay cards in Australia. To achieve this, we have a three-pronged approach: Firstly, to improve the online payment infrastructure and customer experience through gaining greater acceptance of UnionPay cards for online payments by local merchants; secondly, to position and leverage “Mobile QuickPass”, UnionPay’s contactless payment system, as a leading and innovative payment mode in Australia. Lastly, to promote the uptake of UnionPay cards among Australian residents as a viable payment mode which provides convenience and safe transactions in Australia, China and other parts of the world,” said Mr Cai. The Qantas UnionPay MOU signing follows Qantas’ recently launched Sydney-Beijing daily service, which commenced in January 2017. Together with its partners China Eastern and China Southern, Qantas customers can now choose from 130 weekly return flights between Australia and China, with a further 256 connecting services to domestic destinations within China. In 2016, Australia received over 1.2 million Chinese tourists, a 23% year on year growth. In the same period, over 600,000 Australians visited China. UnionPay cardholders visiting Australia who are eligible for tax refunds can also choose to receive the refunds directly into their UnionPay cards when they apply online, through the TRS app or via mail. Since 2014, four major Australian banks have integrated UnionPay into its payment and banking networks, with ninety per cent of local ATMs and seventy per cent of local merchants accepting UnionPay cards for transactions. This entry was posted in Airlines, Airports, Business, Flights, Hospitality, Tour Operators, Transportation, Travel, Travel Services, Travel Tech, Travel Tips & Info, Travelers, Trips and tagged Cai Jianbo, China, China-Australia, Gareth Evans, Memorandum of Understanding, Mobile QuickPass, MOU, Qantas Airways, Qantas Mascot, UnionPay. Bookmark the permalink.